New periodontics technics includes periodontal laser therapy to treat different gingival diseases without the need for gum surgery, local anesthesia and favoring tissue and bone regeneration as well as faster healing time. How gum disease forms ? Periodontal or gum disease is a bacterial infection that affects the teeth supporting structures such as: gingiva, periodontal ligaments and alveolar bone. The gingival pathology is caused by the dental plaque due to poor oral hygiene. if not removed, bacteria that are living in the plaque starts to inflame the gingival tissue and to damage the dental enamel. At its early stage, the disease is called gingivitis and it affects the gingival tissue. If left untreated, gingivitis progress to periodontitis. at this more severe stage, infection attacks periodontal ligaments and the alveolar bone. The result is that the tooth progressively remains without the necessary support, becomes loss and fall. Periodontists have different treatment options and all of them have the same purpose: destroy bacteria, removing the infected tissue, reducing and closing the gum pockets to avoid infection coming back..
Before any therapy, even the laser one, a full periodontal examination is required. The second step involves the dentist or the dental hygienist to perform the professional teeth cleaning. In case of aggressive periodontitis, the periodontist may take x-rays exam to evaluate the bone re absorption grade. Once the doctor has the whole picture of the case to be treated, the scaling and root planning procedure begins. The scope is to remove tartar calculus (hardened plaque) from below the gumline. The treatment attempts to avoid the infection to progress to the surrounding area. After cleaning and disinfecting the pockets, they tend to shrink but there is always the risk other bacteria infiltrate and restart the infection (that is one of the reason why periodontal disease is a chronic pathology). After administering the local anesthesia, the periodontist will use a scalpel to cut the gingival tissue and flip it back to fully expose the tooth root. After removing calculus, perfectly cleaning around the root, bone shaping and disinfecting, the gum flap is stitched back in the previous position. if the periodontist evaluated that the alveolar bone is severely damaged, the bone graft procedure is also required to add bony material and stabilize the tooth. During periodontal laser treatment, the periodontist addresses the pulsed Nd:YAG laser light within the pockets to kill bad bacteria. Next it’s time to remove tartar calculus, dental plaque using ultrasonic and manual tools (scaling and root planning phase). At this point of the periodontal laser treatment, the light is used to stimulate the stem cells and warm up the pockets tissue. A kind of yellowish seal forms and avoids bacteria and dental plaque from getting into the pockets again causing a new infection to restart..
That uses the PerioLase MVP-7 laser type. The cases of relapses strongly decrease. The success rate is close to 90%. Even though all benefits listed above, this article would not be complete without listing the risks of the gum laser therapy. the first risk is to get gingival damages coming from inappropriate wavelength or power level but it happens very rarely. 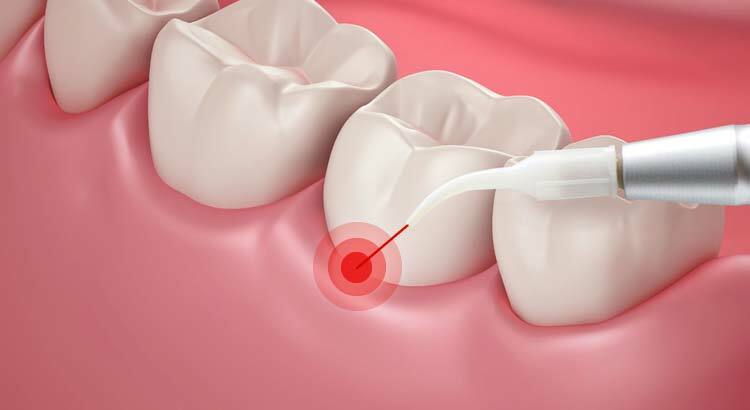 Before to deep dive into all costs of treating gum disease with laser, you should remember that the laser therapy is a complementary method to cure gingival problems. In fact, professional teeth cleaning ($75 to $100), scaling, root planning ($275 to $850) are also required to reach the result beating the pathology. 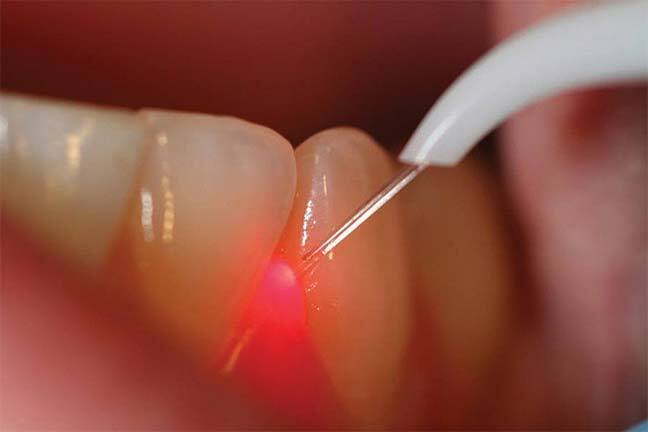 Going back to the main question “how much is the laser gum therapy cost ?”, the most honest answer is that it depends on the periodontal disease severity, degree of receding gums and extent of infection. Some patients may need to treat 3 or 4 teeth while others should undergo a full mouth bacterial decontamination. In order to give you an idea about the laser gum therapy cost, dentists virtually divide the whole mouth in 4 quadrants (upper left upper right, lower left lower right) the average cost of the laser therapy for each quadrant is about $1000. The costs listed above are intended without insurance. Usually dental insurances cover (partially or fully) the cost of the laser gum therapy because the coverage regards the disease not the method your dentist or periodontist will use. Some other health insurances will cover the cost of diagnostic or preventive treatments while others won’t. Before to undergo the laser therapy to treat periodontal or gum disease, you should ask your insurance provider which cost are deductible and which are not. In this way, you will have a clear idea about the price you are going to spend to cure your gingival problems with the laser method. Independently from the therapy adopted by your dentist to treat the periodontal disease, you should pay adequate attention to your oral hygiene. Dental plaque can form in less than 24 hours so it is crucial to remove it before to see hard calculus attached to the root of your teeth. Consider to buy a water-flosser to remove food bristles from in between dental elements, orthodontic braces and brackets . Visit your dentist every 6 months to get your teeth cleaned professionally or even more often if you see any gum disease symptoms as: gum bleeding, swelling and redness. Periodontal laser therapy is still a “young” method to treat gum disease and not all clinician agree about its effectiveness over the conventional gum surgery.